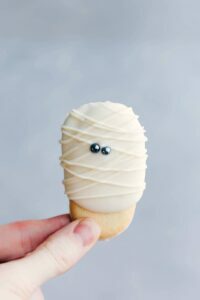 6 fun and festive easy Halloween bags! 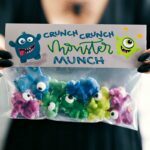 These candies/treats are put in a snack-size ziplock bag and you can staple on the FREE printable bag toppers! 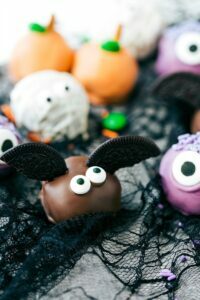 Above this text is a quick video overview of these easy Halloween gifts. 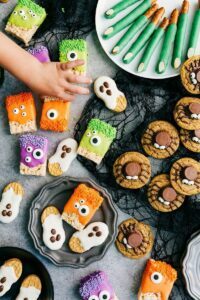 Below is an individual picture of each Halloween bag, the supplies and/or recipes needed, and a link to download the free printable. These printables were designed by the amazing CeeCeeBelle’s! 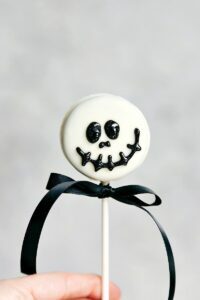 See the second set of Halloween Bag Toppers Here. Each bag has it’s own printable page so you won’t have to print more than what you’ll be gifting. To make cutting and folding the printable easy use a good Paper Cutter and a Scoring Board. I found that Zip-loc has the nicest looking snack-size bag, but any snack size bags will work. Do not print straight from the website file; make sure to first SAVE it to your computer and then print. If you’re still having issues, try a different browser or feel free to drop me an email! If you would like to have these printed, cut, scored, and shipped to you, click here to shop. 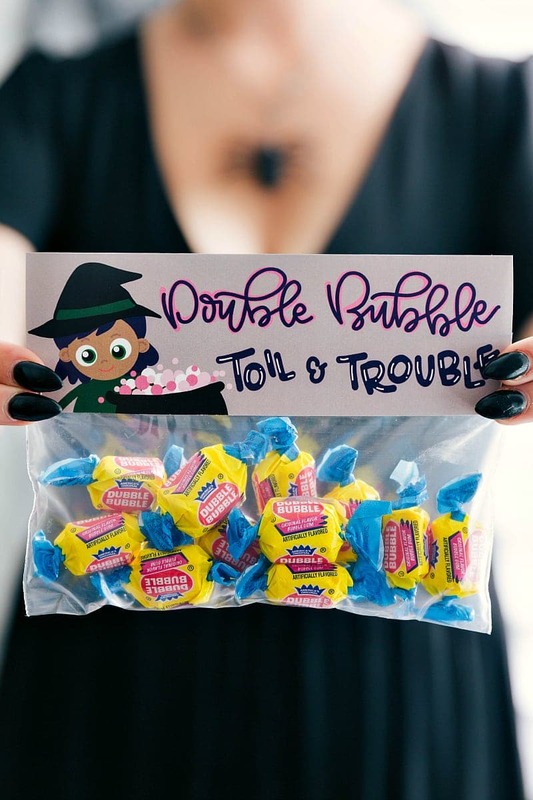 First up: Double Bubble Toil and Trouble. Fill up the snack-sized bags with Double Bubble gum and seal the bag. 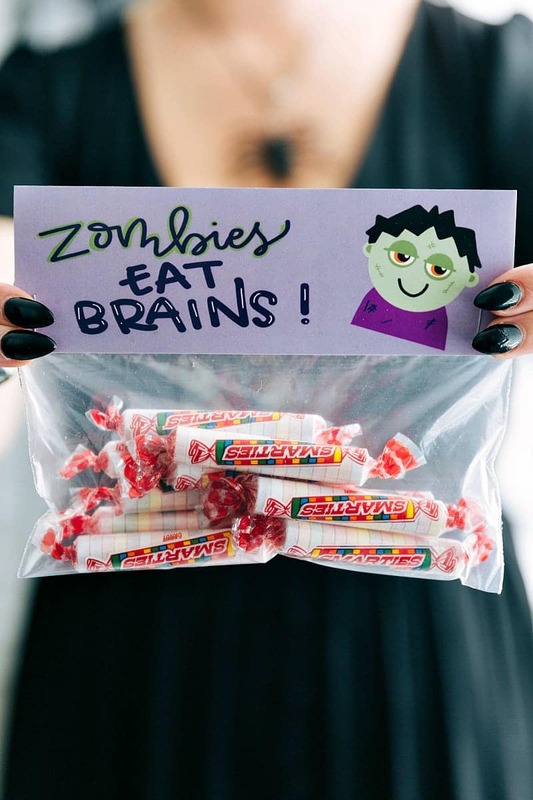 Cut out, score, and fold the printable over the candy filled bag. Staple each side and these are ready to gift! Next up: Cookies and Scream. 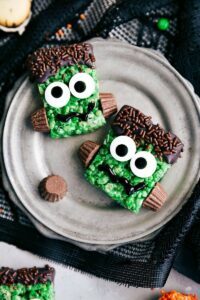 Fill up the snack-sized bags with 3-4 of the fun sized candy bars. Cut out, score, and fold the printable over the candy filled bag. Staple each side and these are ready to gift! Fill up the snack-sized bags with the vanilla wafers. Cut out, score, and fold the printable over the candy filled bag. Staple each side and these are ready to gift! 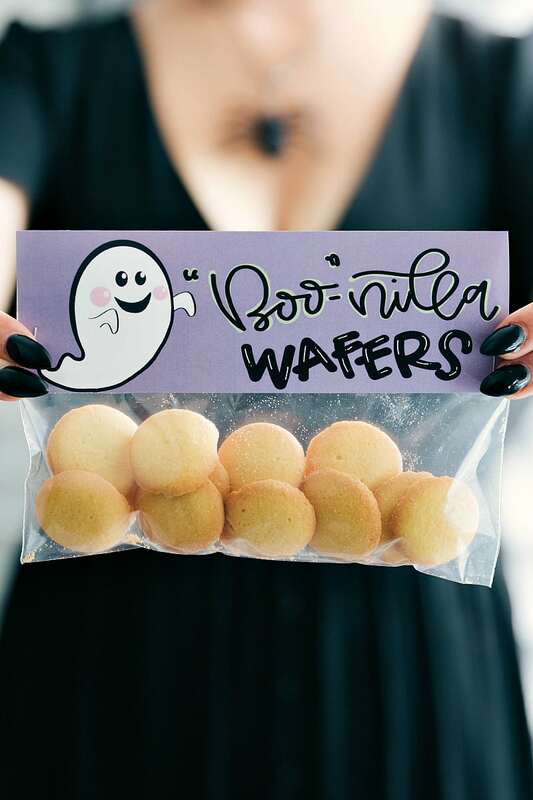 *Even though the bag is sealed, don’t package these more than 1-2 days before gifting to keep the wafers at maximum freshness. Next up: Crunch, Crunch Monster Munch. 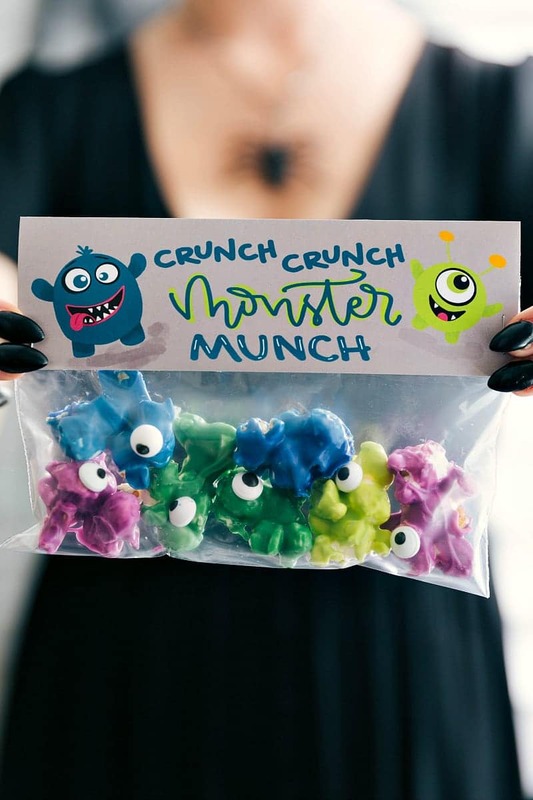 Fill up the snack-sized bags with the “monster munch.” Cut out, score, and fold the printable over the candy filled bag. Staple each side and these are ready to gift! Place each color of candy melts in separate microwave-safe bowls and add 1 teaspoon shortening into each bowl. Microwave in bursts of 20 seconds stirring in between each burst for 15 seconds until the candy melts are completely melted and smooth. Be patient to avoid burning the chocolate. Separate the popped popcorn into 4 different bowls. Pour each color of melted candy melts into one of the bowls. Stir quickly until popcorn is completely coated. Pour the candy coated popcorn separated onto PARCHMENT lined sheet pan(s). Spread the popcorn out evenly and then evenly press in edible eyes. Let stand for 5-10 minutes or until the chocolate has hardened. Break up into small pieces then place in the snack sized bags. 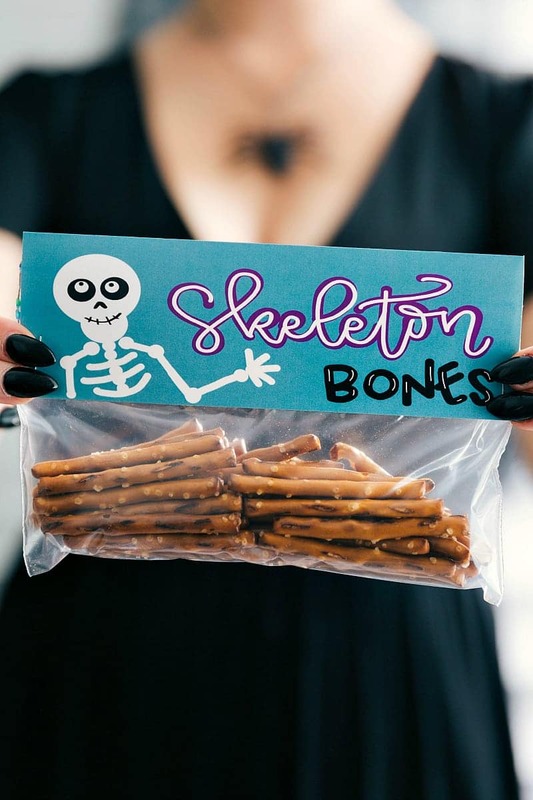 Fill up the snack-sized bags pretzel rods. Cut out, score, and fold the printable over the candy filled bag. Staple each side and these are ready to gift! *Even though the bag is sealed, don’t package these more than 1-2 days before gifting to keep that at maximum freshness. Fill up the snack-sized bags with Smarties. 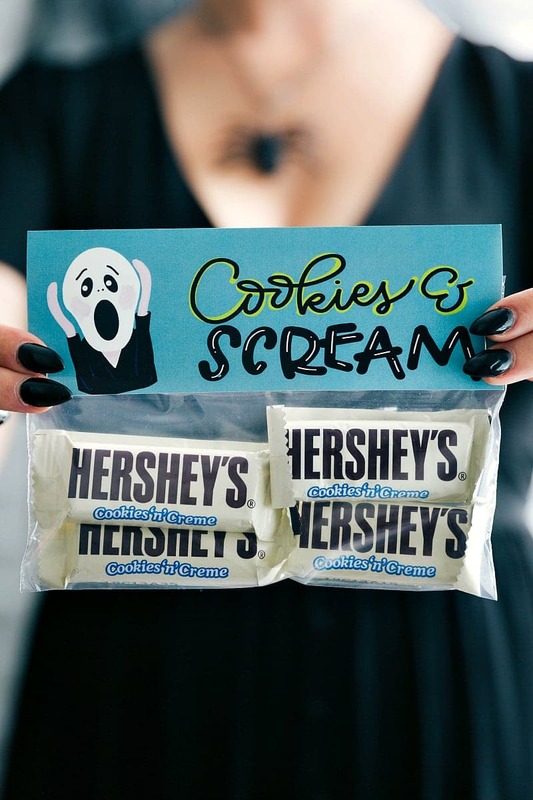 Cut out, score, and fold the printable over the candy filled bag. Staple each side and these are ready to gift! 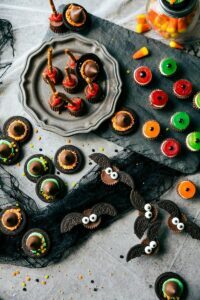 Monster eyeballs, witches hats, witches brooms, & bat bites. Some of the links above are affiliate links which means if you were to buy through that link, I would receive a small commission at no extra cost to you! Thanks for supporting Chelsea’s Messy Apron!